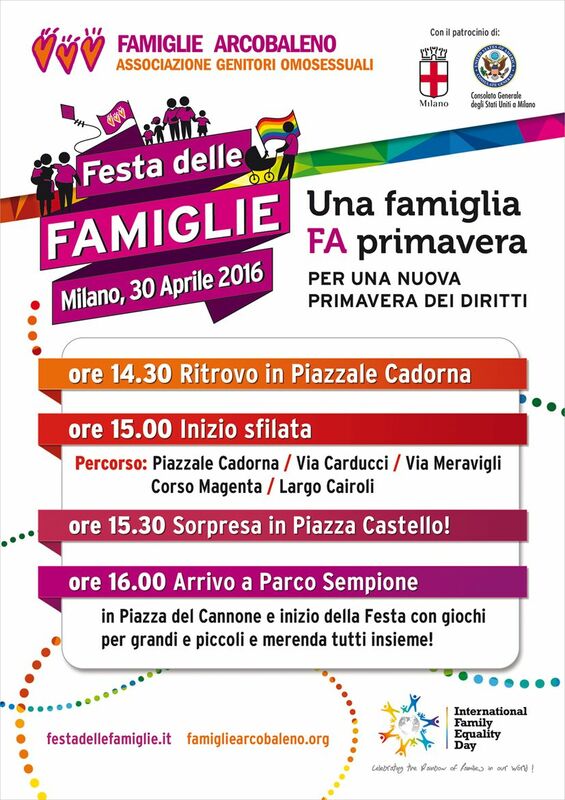 On April 30th 2016, Famiglie Arcobaleno, the Italian association of homosexual parents, will make IFED (the International Family Equality Day) coincide with the 8th edition of its main annual event, the Festa delle Famiglie which is a national celebration of all kind of families. This year the Festa delle Famiglie will take place in Milan and will gather rainbow families from all-over the country as well as different groups, associations and citizens that believe in making a statement for equality and inclusion in society. The IFED event in Milan will be a celebration day of games, tales, and music with the aim of providing fun for all children and families. It is important to point out that the 2016 Festa delle Famiglie is happening few weeks after the Italian Senate decided to deny equality to all children eliminating from the “civil union law proposal” the “step child adoption” (the possibility by the non-biological parent of legally adopting his child). In this context, many associations and Italian celebrities are supporting the 2016 Famiglie Arcobaleno’ s event because the fight will not stop until equality for all citizens, families and especially for all children is reached.